Ready to feed the animals! Katy's first elementary school field trip was to the Lazy 5 Ranch! I also tagged along as a class chaperone. Lil' Miss has been to the Lazy 5 Ranch several times, before. However, she had just as much fun this time, as she has in the past. 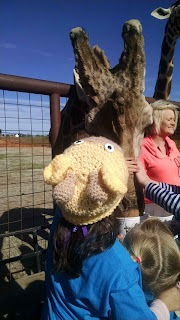 She had no hesitations or reservations going up to the animals and feeding/petting them. Such a difference from the first time (years ago) we visited and she wanted nothing to do with the animals! 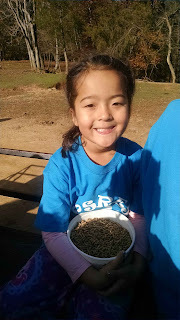 The kids had a blast riding the horse-drawn wagons through the ranch and visiting the petting area. After we were done with the animals and after a very thorough hand scrubbing (!! ), the kids ate their packed lunches and played (aka, ran off all that energy!) on the playground. Back in October, I had the opportunity to read to Katy's class as a "mystery reader." I chose to read one of my childhood favorites, The Berenstain Bears, Mama's New Job. In the book, Mama Bear turns her hobby- quilting- into a new quilt shop! I love how each student chose to illustrate their own square. There were zebras (class mascot), stick figures, hearts, rainbows and more! So fun! Katy's is the square with the pink heart (third row down, third column over). I posted the above picture a couple of weeks ago for a Wordless Wednesday. Katy's teacher had emailed the picture to me to show how us well Katy was doing counting by tens. Well, ever since that, Katy will use that number (210) as the end-all-be-all number. For example, Katy will exclaim that she, "...loves My Little Ponies 210!" Aka, she loves them ALOT!. Or, she'll grumble that Saturday chores will, "....take FOREVER!! Like, 210 minutes!!" Aka, chores will take FOREVER! 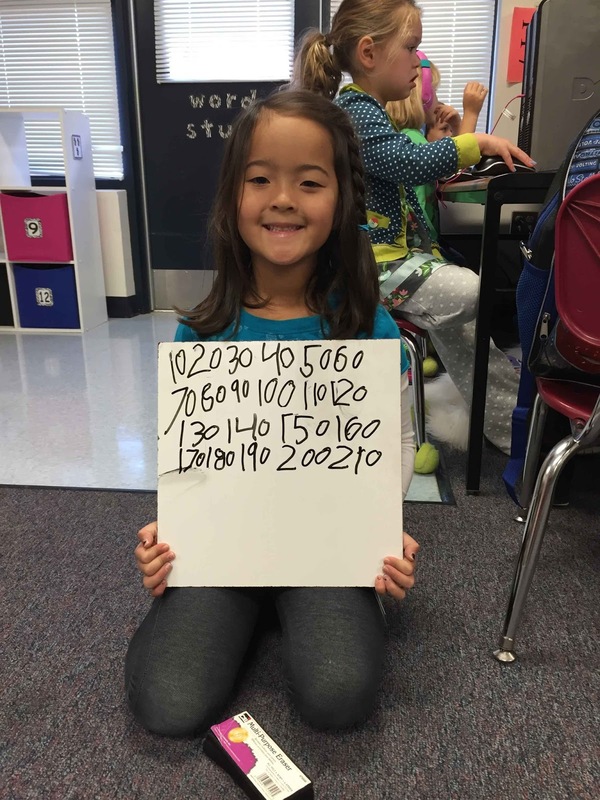 My personal favorite, though, is when she tells me that she, "...loves me 210!" Which, in my book, is better than infinity, better than, "to the moon and back!" Have I got a treat for you, today! 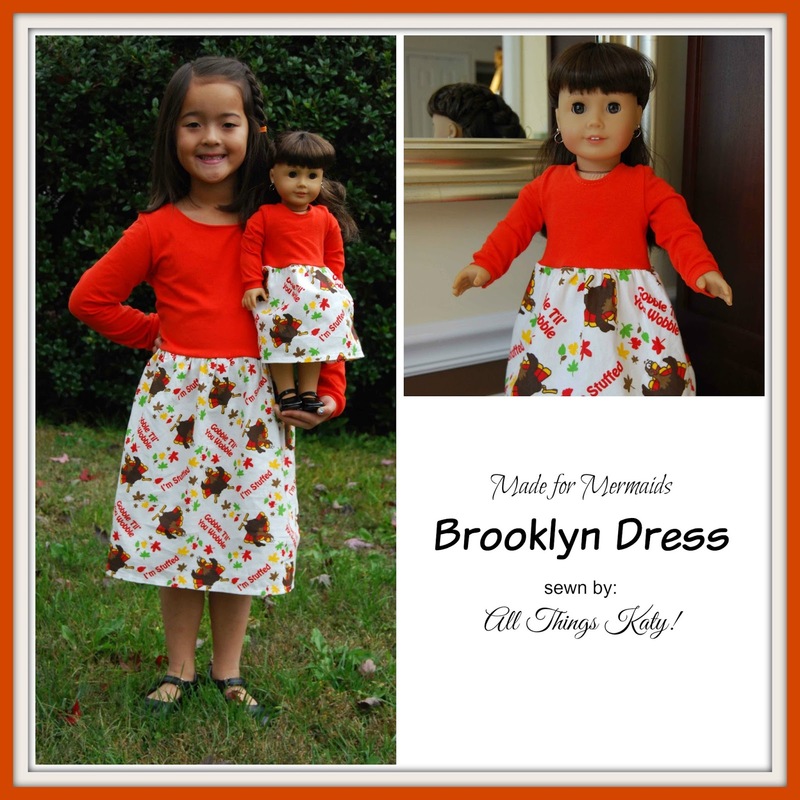 Today, I'm going to be spotlighting Made for Mermaids' newest PDF sewing pattern, the Brooklyn Dress and Maxi! Made for Mermaids Brooklyn Dress and Maxi features a soft, knit bodice and either knit or woven skirt. This dress included several sleeve options, skirt length options and lots of room for creativity! Sew much fun! -Made for Mermaids Brooklyn Dress and Maxi is sized for girls 1/2-14y. -Made for Mermaids Brooklyn Dress and Maxi PDF sewing pattern includes a sizing chart, fabric requirement chart, cutting chart and printing chart (slide 15). -Made for Mermaids Brooklyn Dress and Maxi PDF sewing pattern includes two skirt lengths- dress or maxi. options- short, mid and long. 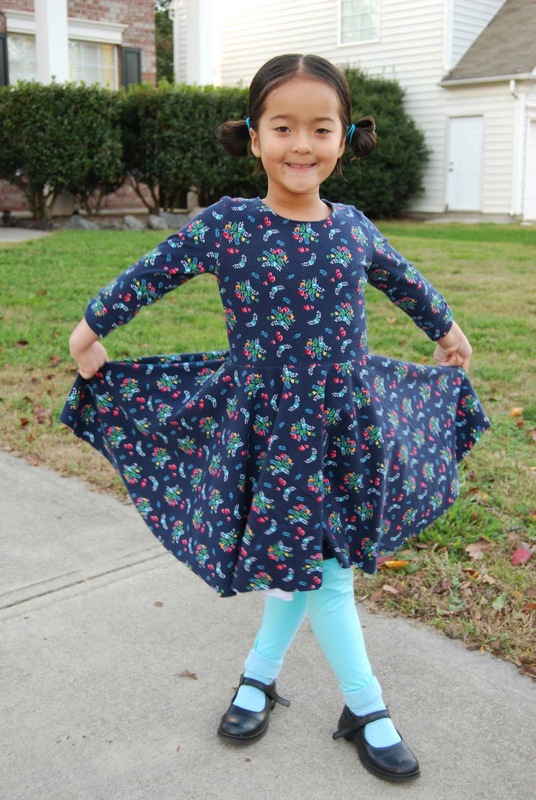 -Made for Mermaids Brooklyn Dress and Maxi PDF sewing pattern includes pattern pieces for optional shoulder flutter and pocket. 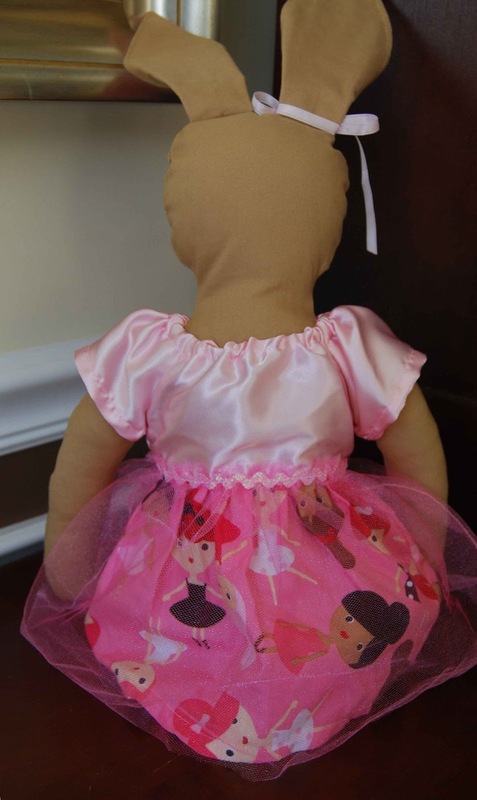 -Made for Mermaids Brooklyn Dress and Maxi bodice can either be fully lined, OR just face lined. 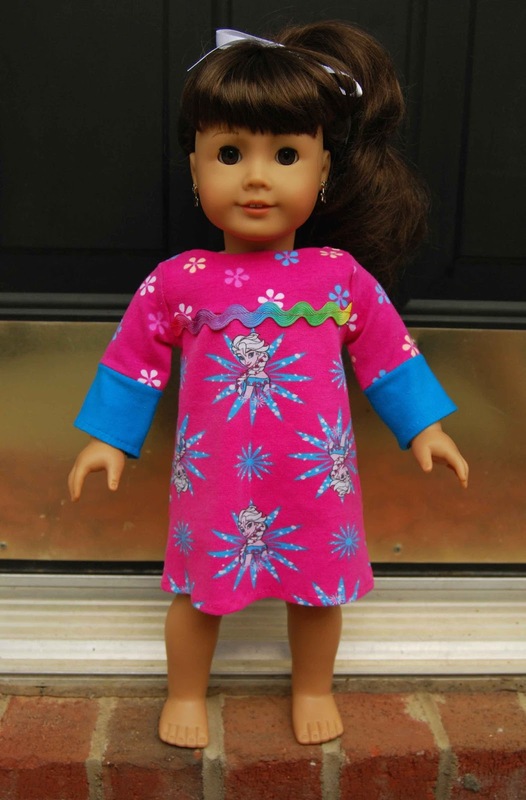 -Made for Mermaids Brooklyn Dress and Maxi PDF sewing pattern features step-by-step instructions with color photographs and simple arrows and lines to guide the sewer along. -Made for Mermaids Brooklyn Dress and Maxi can be mixed and mashed with the Made for Mermaids Riley Dress. Since the Made for Mermaids Brooklyn Dress and Maxi has zero ease in the bodice (ie, meaning, meant to be close-fitting) I sewed up a size five width, size six length, long-sleeve, dress length Brooklyn Dress. I did not include a pocket or optional flutters for my test dress. Also, I face-lined the bodice for all of the dresses pictured. 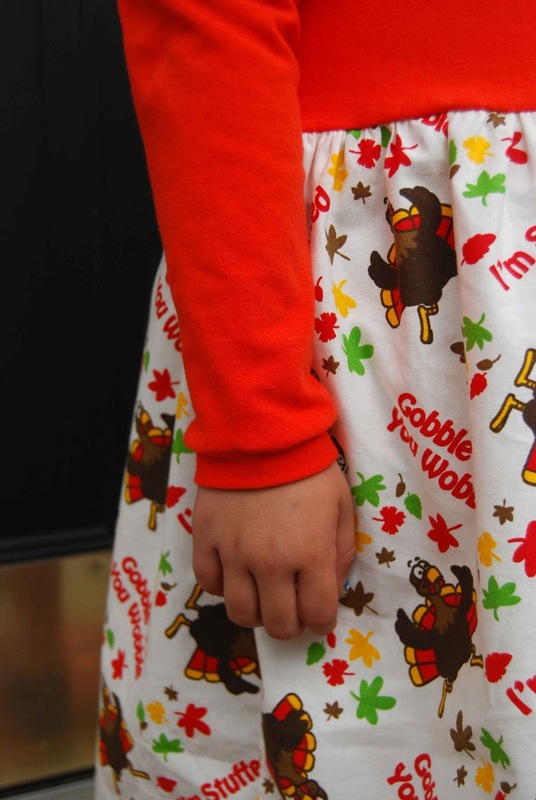 Woven fabric for my test dress (orange, Thanksgiving dress) was purchase from locally from Hancock Fabrics and the orange knit was purchased from online from Purpleseamstress Fabrics. This dress is a dream to sew up! 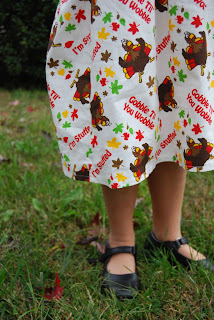 So, sew easy and quick to accomplish! I love that you can use a mixture of wovens and knits. If you do not use any of the optional pattern piece (pocket, flutters), the Made for Mermaids Brooklyn Dress and Maxi can be sewn up in less than two hours (print to finished hem). 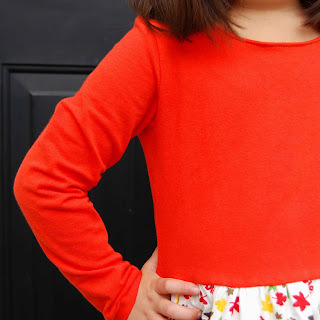 My daughter loves the comfy knit top and love that knit doesn't have to be ironed! I also really like that the Made for Mermaids Brooklyn Dress and Maxi has various options to make the dress your own, unique creation! Pockets! Flutters! Sleeves! Hem length! The Made for Mermaids Brooklyn Dress and Maxi can be dressed up with fancy fabrics or dressed down for the perfect everyday play dress in comfy cotton knits. It's no secret that I love Made for Mermaids PDF sewing patterns!! 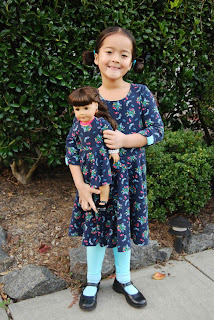 The Brooklyn Dress and Maxi is no exception- the tutorial is easy to read, the pattern pieces are simple to put together and print (no trim edges and layered pattern pieces!!). Sizing was spot-on and the fit was comfortable and flattering. 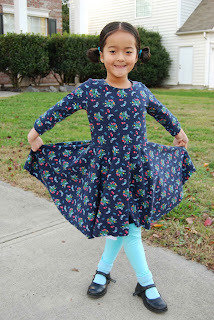 I loved the Made for Mermaids Brooklyn Dress and Maxi pattern so much that I just had to make more... lots more... the true hallmark of a really great pattern (in my humble opinion), is the fact that I keep coming back to it over and over again...! 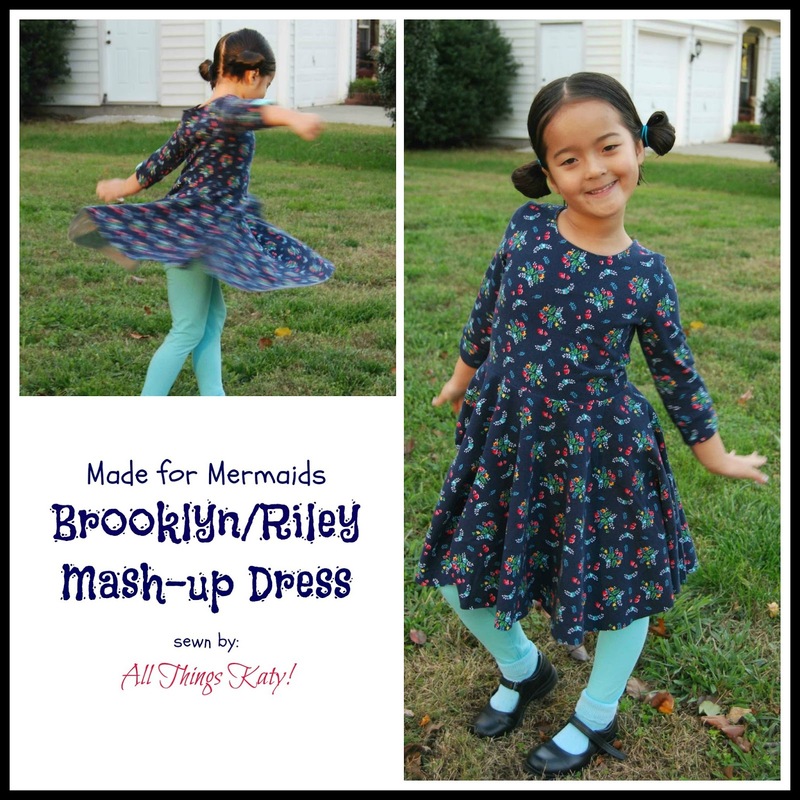 First, the Made for Mermaids Brooklyn Dress and Maxi PDF sewing pattern has a matching Dolly Brooklyn Dress and Maxi available for purchase, separately. Lil' Miss LOVES her matching dolly dresses for her dolly pal, Samantha. I mean, Samantha just had to have a matching dress....! Next, I've been hoarding saving this adorable Fancy Nancy rib knit from Purpleseamstress Fabrics for awhile, now. I was waiting for just the right dress to showcase it and the Brooklyn Dress and Maxi is just perfect for creating a comfy, fun, frilly dress that even Nancy, herself, would deem, "tres chic!" For the Fancy Nancy Brooklyn Dress and Maxi, I sewed up a size five bodice, six length dress, 3/4 sleeve length, optional shoulder frills (because Fancy Nancy would definitely want frills!) and optional pockets. 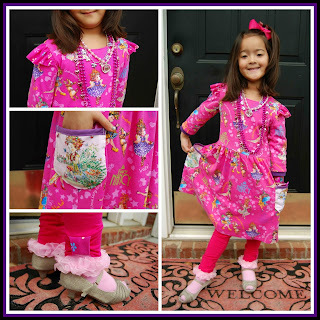 I also sewed up coordinating, pink Made for Mermaids Bonny Leggings using the bow cuff tutorial found here. Made for Mermaids Brooklyn Dress and Maxi and Bonny Leggings- Ooh, la, la!! 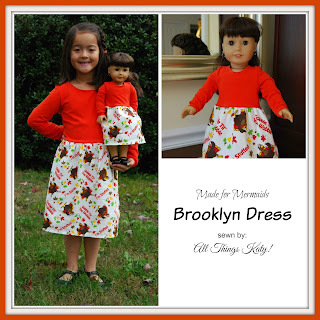 Last, but certainly not least, I sewed up a Dolly and Me Brooklyn Dress and Maxi/Riley Dress mash-up. I used the bodice/sleeves of the Brooklyn and the circle skirt of the Riley. I sewed up a size five bodice width, size seven skirt length, 3/4 sleeve. Floral, navy Riley Blake knit fabric was purchase directly from the lovely Made for Mermaids Fabric Shop. The solid aqua knit used for the coordinating Bonny Leggings was purchased online from Purpleseamstress Fabrics. Because of the Riley Dress full circle skirt, it has TWIRL factor!! Twirl, baby, twirl!! 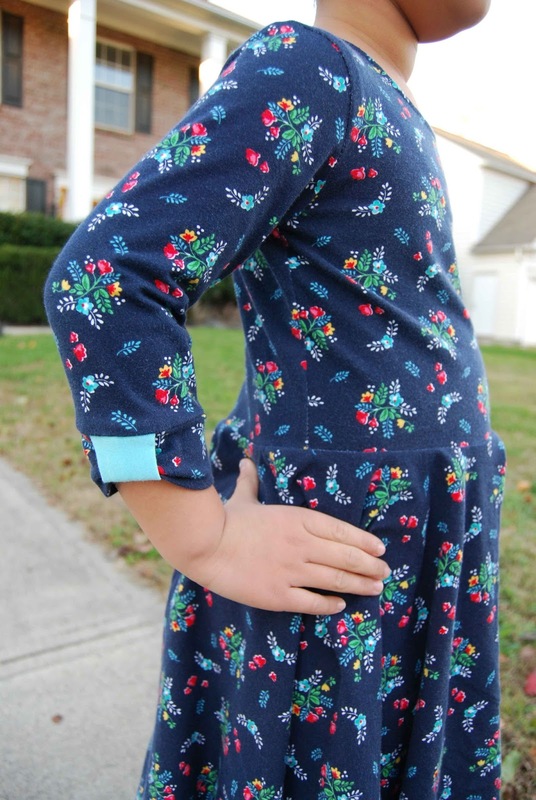 Also, I slightly modified the last Brooklyn Dress and Maxi/Riley Dress by using the bow cuff tutorial found here for the sleeve hem bands. Such a great, twirly, fun dress!!! So, whatever option you sew up, whatever combination you choose, you can't loose with the lovely Made for Mermaids Brooklyn Dress and Maxi! Have fun and happy sewing! Lil' Miss started kindergarten this year.... and with it comes the onslaught of germs.... Colds! Sore Throat! Cough! And, of course, the dreaded flu!! 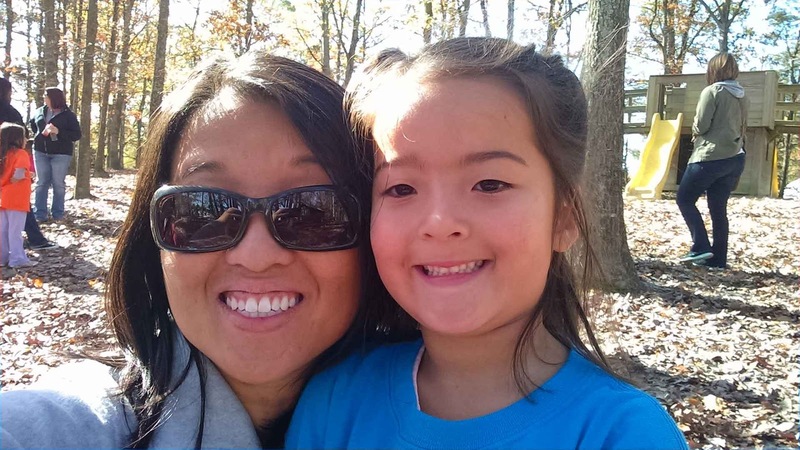 Those darn elementary school are a darn petri dish of all sorts of nasty germs! I've been giving Lil' Miss a multivitamin for awhile now. And, while I'm happy with her current supplements, I was interested and intrigued to try the more natural, non-GMO Rainbow Light Power Sours Multivitamin. "Rainbow Light®, the #1 most trusted natural vitamin brand* , delivers research-based formulations that include a blend of superfoods, organic, non-GMO spirulina, plant enzymes, probiotics, and botanicals for enhanced digestion, absorption, and a difference you can feel. Rainbow Light has formalized its 30 year history of good corporate citizenship with its Circle of Care program, encompassing the company’s work as founding supporter of Vitamin Angels and a growing network of aid partners to provide life-saving nutrition to mothers and babies everywhere. Rainbow Light keeps over 10 million plastic bottles out of the waste stream annually with its trademarked, 100% upcycled EcoGuard™ bottles." • Power Sours Multivitamin Gummies promote healthy bones, brain, and eyes, plus balanced energy. • These naturally fruit-flavored gummies are additive and preservative free and available in four delicious flavors: strawberry, pineapple, raspberry, and lemon. 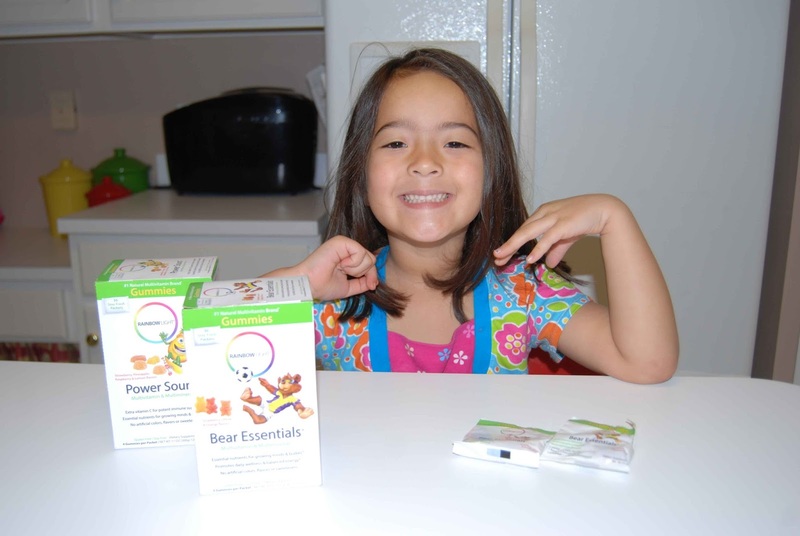 Lil' Miss sampled the Gummy Bear Essentials Multivitamin and Multimineral. My first reaction when Katy opened up the package was the that the vitamins smelled bad. Not rancid, or spoiled. Rather, they smelled fake. Kind of ironic for a vitamin company that claims to be natural. However, Lil' Miss was non-plussed by the smell and she swallowed the vitamins without complaint. She proclaimed the vitamins to be favorable in taste and she asks for Gummy Bear Essentials Multivitamin and Multimineral (over her typical vitamins). As a mom, I appreciate a vitamin that is free of preservatives and artificial dyes (the Gummy Bear Essentials Multivitamin and Multimineral are also free of gluten, wheat, milk, soy, nuts, eggs, fish and yeast). I can also appreciate the fact that Rainbow Light Power Sours Multivitamin come in 100% upcycled bottles/boxes. The Gummy Bear Essentials Multivitamin and Multimineral come in convenient single-serve packets (which, in my opinion, is an excess of packaging). Three gummy bears make up a serving of Gummy Bear Essentials Multivitamin and Multimineral (ages four and older). Personally, I find three bears to be border-line too much. 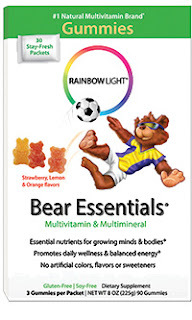 The Gummy Bear Essentials Multivitamin and Multimineral contain 5g of sugar opposed to the 3g (for two bears/serving) found in Katy's typical, main-stream multivitamin. Hello, Happy Readers! I have a treat for you, today!! 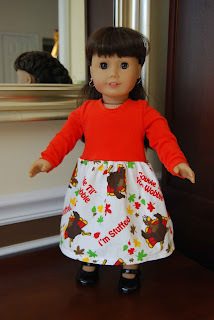 I want to introduce you to one of my new favorite PDF sewing pattern designers, My Childhood Treasures! Hailing from the land down under, this talented Australian designer has a wide array of fun, sweet and simple sews for boys, girls and dolls. I just love Dixi's straight-forward tutorials and clear photographs. 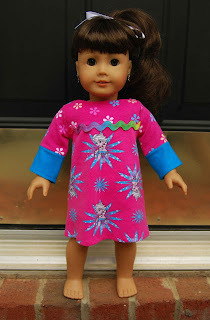 Her patterns sew up quickly and easily and I never find myself wondering what to do next and/or confused at each step. 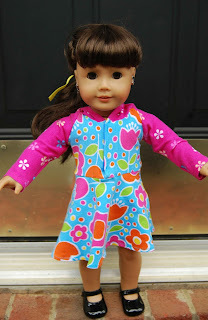 Even a beginner could confidently tackle most My Childhood Treasures PDF sewing patterns and create a beautiful wardrobe! 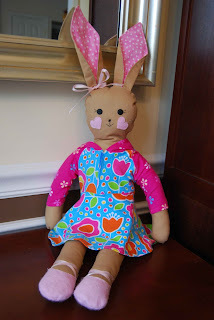 Today, I'd like to highlight her newest pattern, the Rachel Rabbit TOY sewing pattern. The Rachel Rabbit TOY sewing pattern is a PDF sewing pattern for a stuffed rabbit toy. This was my first time sewing up a stuffed animal and I am pleased to report, it couldn't have been simpler! Yay! -The Rachel Rabbit TOY sewing pattern helps you create a 26 inches (from the tips of her ears to her toes) stuffed toy that is designed to fit most of the My Childhood Treasures doll patterns. 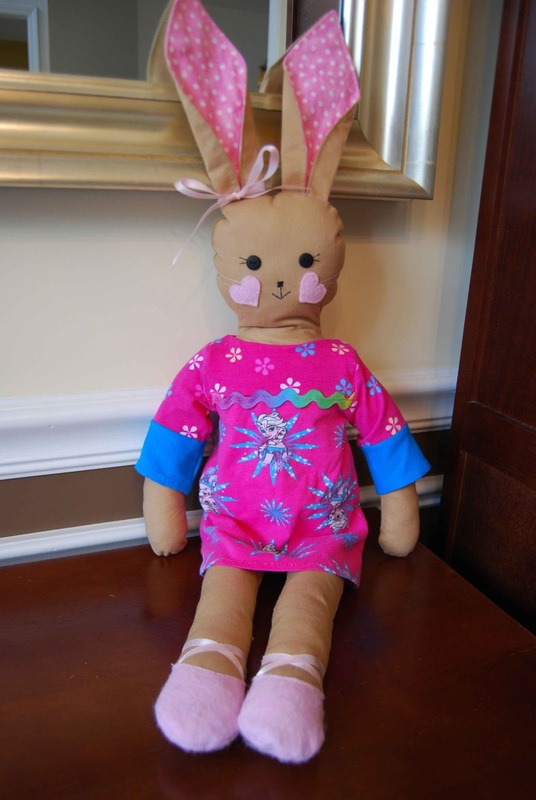 -Woven, no-stretch fabrics are recommended to create the body of the Rachel Rabbit TOY sewing pattern. -Felt, scraps of fusible fleece, buttons and/or safety eyes and poly-fil stuffing are required to complete the Rachel Rabbit TOY sewing pattern. 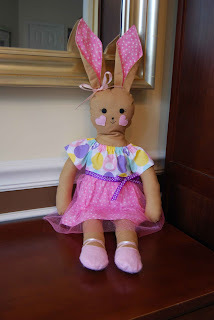 I sewed up the Rachel Rabbit TOY sewing pattern using scraps of woven cottons that I already had in my fabric stash. 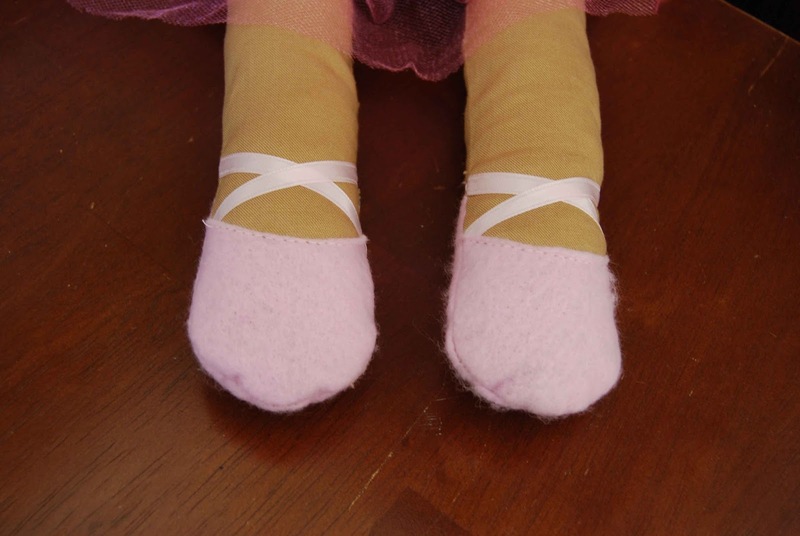 I used buttons for the eyes and scraps of felt for the shoes and heart cheeks. The only thing that I had to go out and purchase was the poly-fil. Not only was the Rachel Rabbit TOY sewing pattern easy to sew up, but it was fun, too! 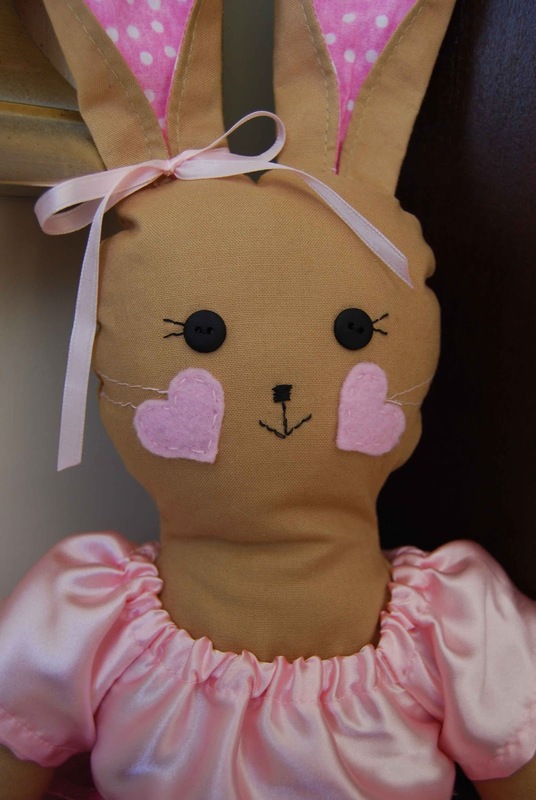 Look how cute the Rachel Rabbit TOY sewing pattern sews up! There are many ways to dress her up, or dress her down. Depending on your level of detail, you could change up her face, her shoes and even the color of her ears. Simple hand sewing techniques are illustrated and explained in the Rachel Rabbit TOY sewing pattern sewing tutorial- this was especially helpful to me as I've never done much hand sewing, before. 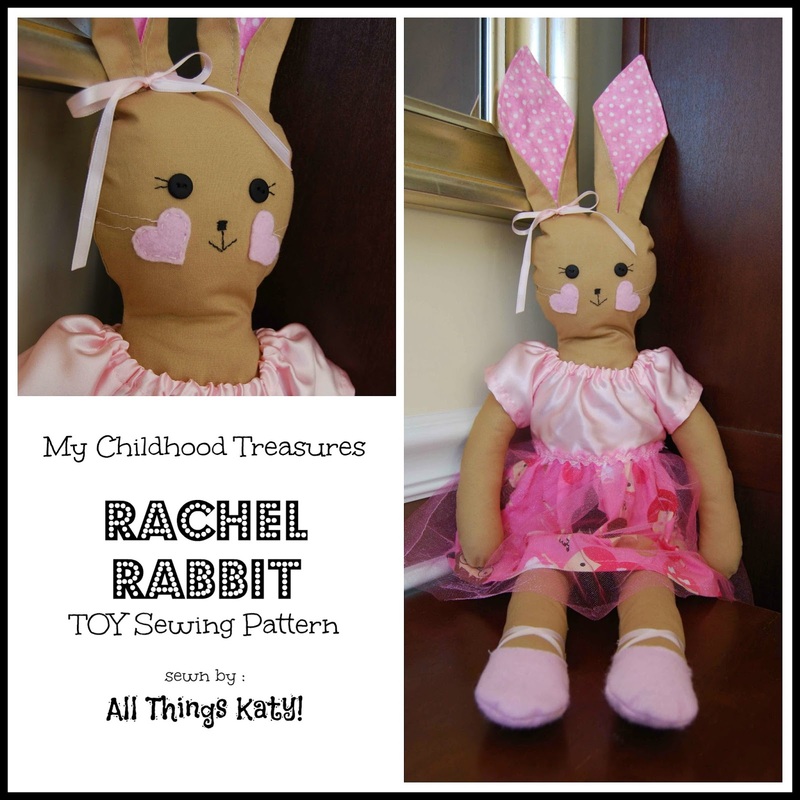 The Rachel Rabbit TOY sewing pattern would make a wonderful, inexpensive yet fun Christmas gift for any little girl! Did you know that the Rachel Rabbit TOY sewing pattern has a male counterpart, the Raphaello Rabbit TOY sewing pattern? Now you make a pair- adorable! My daughter is already asking for a "husband" for her Rachel Rabbit! Heehee! I've already sewn several of My Childhood Treasures doll patterns for my daughter's American Girl doll. So, I decided to try on some of those dresses on the Rachel Rabbit and see how they fit. My Childhood Treasures doll patterns do, indeed fit both 18" dolls and Rachel Rabbit TOY sewing pattern! I love when a pattern can be used multiple ways and extends the use of the pattern! Thank you, Dixi, for allowing me to test and review the Rachel Rabbit TOY sewing pattern! It has been my pleasure to sew up your pretty patterns. I can't wait to sew up more!